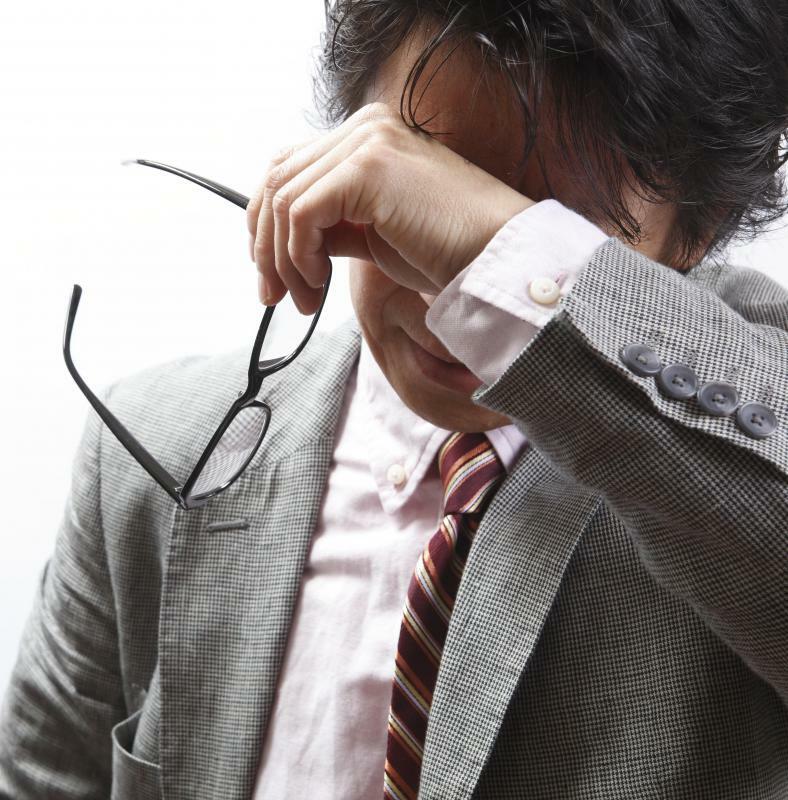 Ulcers were once believed to affect those who were overworked more than others. Stomach ulcers may be aggravated by the caffeine contained in coffee products. Very painful lesions in the stomach are referred to as peptic ulcers. 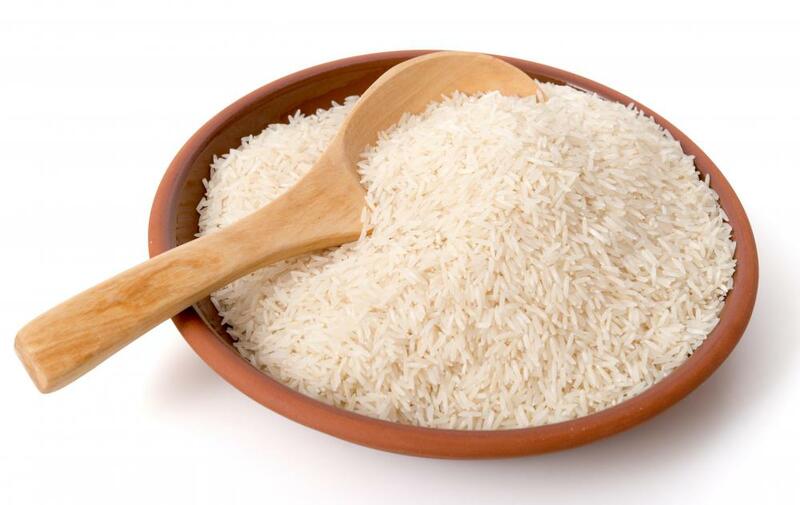 Bland foods like cooked rice are recommended for anyone who has ulcers. The presence of a peptic ulcer may cause nausea and vomiting. 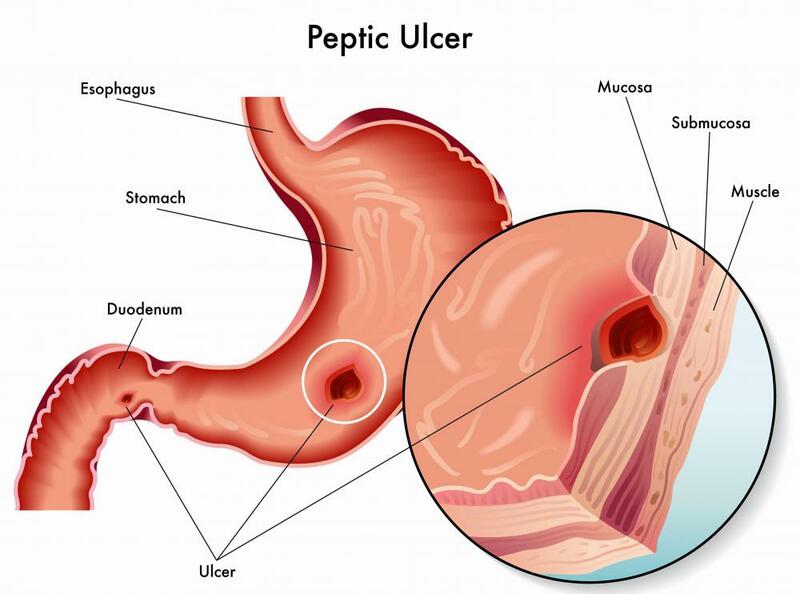 While the word ulcer can refer to any type of sore or lesion that won't heal, in common usage it typically refers to peptic ulcers, very painful lesions that form in the stomach or intestine. For years, even centuries, they were believed to be caused by stress and/or particular kinds of food and were considered a chronic condition. That is, it was thought that people couldn't "cure" this condition, they just just had to manage it with antacids, diet — eating only bland food, for example — and lowering stress levels. The classical stereotype of the overworked Type-A manager would depict him getting off the phone and reaching for antacids as he clutched his midsection, with the idea that stress was making him ill.
Because the stomach is a highly acidic environment, it was thought that bacteria simply couldn't live there for long. In 1982, however, Robin Warren, an Australian pathologist, proved that patients with chronic ulcers also had colonies of bacteria inhabiting their stomach. Barry Marshall, of the University of Western Australia, took this finding and, working with Warren, located and identified the bacterium in question, which they named Helicobacter pylori. Their findings were so contradictory to prevailing conventional wisdom that their work got very little notice, even though it promised a permanent cure to this condition. In a dramatic display of the validity of their findings, Dr. Marshall deliberately infected himself with Helicobacter pylori and gave himself ulcers, which were then cured by a round of antibiotic treatment. Still, it took the next two decades to overthrow long-held beliefs on the treatment of this problem, and many laymen today still believe that it is chronic and incurable. In October 2005, Warren and Marshall were awarded the Nobel Prize in medicine, in recognition for their groundbreaking work. What Is the Treatment for a Curling's Ulcer? What Are the Best Tips for a Gastric Ulcer Diet? What are the Most Common Causes of Ulcers in Children? What is a Bleeding Ulcer? Although the pain in stomach ulcers is caused by H. pylori, there are several other risk factors that can be called causes of stomach ulcers. For instance, those with heavy smoking and drinking habits are much more at risk for ulcers than those who drink moderately and don't smoke. Long-term usage of painkillers can also irritate your stomach lining, leaving you susceptible to ulcers. Additionally, some chronic diseases can increase the likelihood of having an ulcer. Finally, although stress is not the cause of stomach ulcers, it is often a contributing factor. @gregg1956 -- The most common stomach ulcer signs and symptoms are those you mentioned; stomach pain and burning. However, it often presents like heartburn or indigestion, especially in the beginning. Most people with ulcers begin to experience pain and burning in their upper abdomen, and sometimes beneath their breastbone. The pain tends to come and go, and is sometimes exacerbated by eating. The pain is so severe that it wakes sufferers up at night. 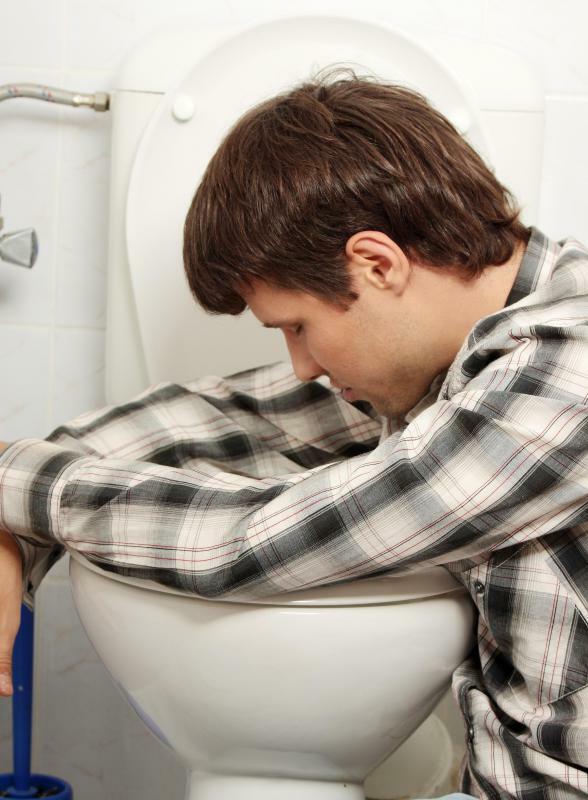 In very severe cases, weight loss, blood in the stool and vomit, and anemia sometimes occur. Even those who think they may just have chronic heartburn should consult with their doctor, since both chronic heartburn and ulcers can have very serious complications. 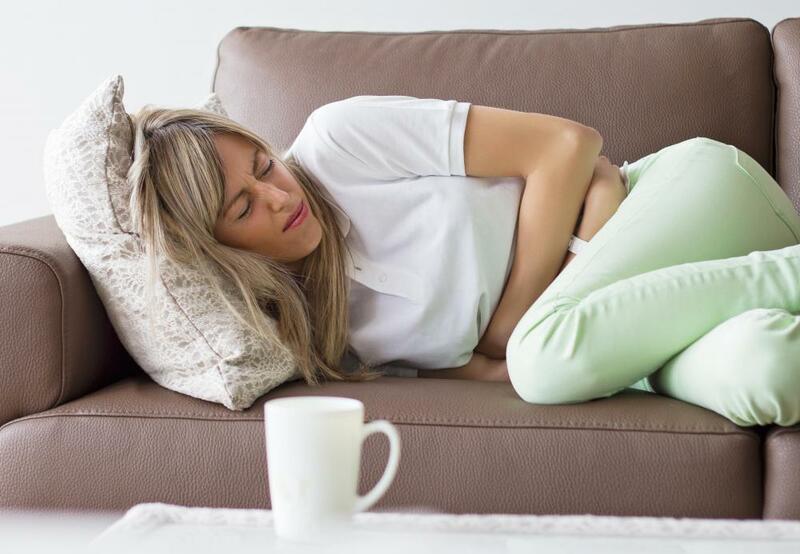 So what are common stomach ulcer symptoms? Aside from the stereotypical burning and pain in the stomach, are there any others? One day when traveling in the car, i had a sharp pain at the left side of my abdomen. I have been suffering for more than eight years but not even a single doctor was able to detect the problem. In October last year while tossing in the bed, i had a feeling as if something was tearing inside my stomach (like when one is yawning and the corner of the lips tear). But there is no bleeding and O even know it's like there are ulcers somewhere. i thought maybe there is a problem with fallopian tubes or something. Can you help?